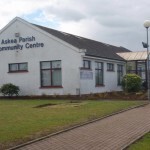 The Parish Office for Askea and Bennekerry is located in the Askea Parish Community Centre, opposite the Church. Opening Hours: Parish Office – Monday to Thursday 9 am to 4 pm; Friday 9 am to 11 am; Parish Centre – Monday to Friday 9 am to 10 pm. – Services include Baptismal, Confirmation and Marriage Certificates, all Parish communications etc. To book a meeting room in the Community Centre please contact (059) 91 42565.